Johannesburg - Sports minister Fikile Mbalula said he backed Oscar Pistorius after the "Blade Runner" lashed out following his failure to win gold in the men's T44 200 metres final at the London Paralympics. Pistorius was beaten in the final few metres of the race by Alan Oliveira of Brazil, and the South African claimed the length of his opponent's prosthetics gave him an unfair advantage. “Pistorius, I back him. We are celebrating him as a nation and he's a great inspiration,” Mbalula said at the launch of the 2012 SA Sports Awards at FNB Stadium on Monday evening. 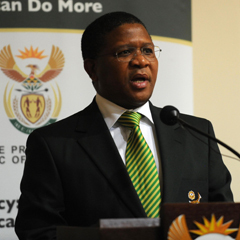 Mbalula said he would not comment further on the issue until he had all the facts. “I don't want to comment on that because the athlete is the person who is toiling and we understand the situation," he said. “Up until I get the facts I will prefer not to say anything because anyone can basically complain about what they have seen in a particular moment." Pistorius had earlier apologised for the timing of his comments, which he made immediately after Oliveira came from behind in the home straight to beat him by 0.07 seconds on Sunday night. "I would never want to detract from another athlete's moment of triumph and I want to apologise for the timing of my comments after Sunday's race," Pistorius said. "I am a proud Paralympian and believe in the fairness of sport." Mbalula, meanwhile, was impressed with the SA team's Paralympic performances after they bagged 12 medals in the first five days of competition. “It is fantastic. It is exceptional," Mbalula said. "On Thursday I will be going to London to support our Paralympians. “I told them before they left they would do exceptionally well. “They will keep going and we're very proud of them.